Guest Check Card Holder Presenter - 20 Pack Restaurant Server Bill Book - Black with Gold Thank You Imprint - Size 5.5" x 10"
PREMIUM CHECK CARD HOLDER VALUE PACK- We know how valuable customers are for restaurants, bars, diners, or other business establishments that handle cash, bills, checks and receipts so our guest check presenter is the perfect restaurant accessory to keep guest satisfied. PERFECTLY SIZED in the popular size of 10" x 5.5". Budgetizer black card holder books comes with plenty of room for card, receipt, check, balance and cash without being too big or bulky. Fits nicely on a server apron, table, bar and in between plates or glasses. This has all the convenient features you want including durable credit card, receipt and cash pockets. PREMIUM QUALITY- You can expect these to last a long time with the durable plastic and black vinyl cover. Our waterproof bill holder protects checks, receipts, paper and money from water, sticky drinks and stains making it one of the best waitress supplies. It is washable and cleaning is easy with a moist cloth or sponge so they look fresh and clean daily. 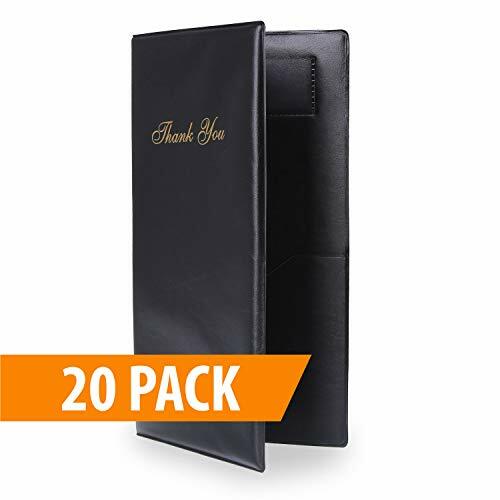 RESTAURANT SERVER GUEST CHECK PRESENTER is the perfect server wallet with the right black color and the famous gold imprint on the outside that politely says "Thank you" to your guests. It is uniquely made with an extra padding on the cover for additional cushion to make them more durable and elegant. 100% MONEY BACK GUARANTEE ensures this will be your best bet for a pleasing no-risk purchase. Budgetizer specializes in finding the best waitress accessories and restaurant supplies to please all business establishments while offering cost-effective value packs. ECONOMICAL VALUE PACK- Budgetizer check card holder comes in a 20-piece pack. Our guest check presenters is all you need for your restaurant, bar, diner, eatery or drinking establishment. DURABLE & EXTRA PADDED- Our server bill holder is made of black heavy-duty vinyl guaranteeing a long-lasting product that will hold up well through thousands of uses. Our server checkbook cover has an extra padding unlike other products in the market. It features an elegant gold script with 'THANK YOU' on the cover. WATER RESISTANT AND PERFECTLY SIZED- Budgetizer bill presenter keeps guest's cards, bills, checks, receipts and cash free of water, drinks and stains. Washable and easy to use for your waiter or waitress. It's the familiar traditional design made to a higher level of quality. It measures 5.5" x 10"
INCLUDES CARD, RECEIPT & CASH POCKETS- Our guest check present features 2 built-in side pockets to securely hold bills, receipts or cash as well as a clear card pocket to visibly display the guest card. Pockets will not rip or tear loose. Slide credit cards in and out freely. 100% RISK FREE - We guarantee that our guest check presenter will meet your expectations. If for any reason, it doesn't, we offer free return no questions asked. 100% money back guarantee ensures this will be your best bet for a pleasing no-risk purchase. View More In Check Presenters. If you have any questions about this product by Budgetizer, contact us by completing and submitting the form below. If you are looking for a specif part number, please include it with your message. Multi Color Elephants Cotton Guest Check Presenter for Restaurant, Check Book Holder, Waitstaff Organizer, Server Book for Waiters, Credit Card Holder, Waiters Pad. Guest Check Presenter Flowers Cotton, Credit Card Holder, Check Book Holder, Check Pad Holder, Waitstaff Organizer, Restaurant Server Book for Waitress & Waiters, Check Register for Hotel. Black Polka Dot Cotton Guest Check Presenter for Restaurant, Check Book Holder, Waitstaff Organizer, Server Book for Waiters, Credit Card Holder, Waiters Pad. Flowers Cotton Guest Check Presenter for Restaurant, Check Book Holder, Waitstaff Organizer, Server Book for Waiters, Credit Card Holder, Waiters Pad.